The math behind the interpolation is fairly simple and uses "barycentric coordinates". You do not need to actually know the math to use barycentric coordinates, but I thought it might be useful to show a simple example where you can see how the math works. Forget meshes for a minute. Lets create 4 locators. The first 3, I'll name loc0, loc1, loc2 and the 4th is just loc. I'll do this in an orthographic view (front, side or top) so that my locators are all in one plane. Then I move loc0, loc1, loc2 around a bit to define a triangle and I move loc so it is somewhere inside that triangle. Next, I select loc0, loc1, loc2 and loc in that order and create a pointConstraint with maintainOffset=False. Since each of the 3 constraint targets have the same weight, loc moves to the "barycenter" of the triangle (think center of mass). But what if I dont want loc to move? What values do I need to set for each constraint target weight so that loc remains in its original position? The answer is, as you have probably guessed, the barycentric coordinates. If you google "barycentric coordinates" you can read some detailed mathematical definitions, but I'm going to jump straight into a simple pymel example which is my own reworking of a post I read here on stackexchange. In this picture the point of interest, P, lies inside a triangle defined by the points P0, P1 and P2. 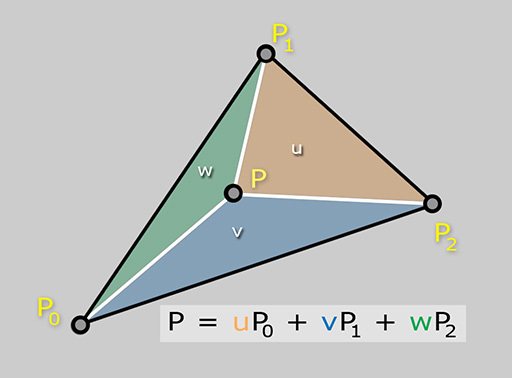 The barycentric coordinates u, v and w are related to the area of each of the 3 segments of the subdivided triangle, each shown here in a different color. The formula shows that the position of P is simply the sum of the each of the triangle points multiplied by its corresponding barycentric coordinate element. So if we relate this back to our constrained locator example, we need to compute the barycentric coordinates of loc relative to loc0, loc1 and loc2, then plug them into the constraint weights.